President Richard Nixon Pardoned John McCain of War Crimes? - Truth or Fiction? President Richard Nixon Pardoned John McCain of War Crimes? Rumors appeared in 2017 that the former Arizona senator had confessed to war crimes and to committing treason during the Vietnam War, but that he was later pardoned. Former Arizona senator John McCain confessed to being a war criminal and to committing treason during the Vietnam War, but he was later pardoned by U.S. President Richard Nixon to spare him from death by firing squad. False claims that Senator John McCain confessed to being a war criminal began circulating in 2008. They’re based on McCain’s admission that his Vietnamese captors forced him to confess to being a war criminal while he was a prisoner of war during the Vietnam War. A more modern twist of the rumor emerged in July 2017 on social media. In that version, John McCain was supposedly convicted of treason and was sentenced to die by firing squad before President Nixon pardoned McCain. Like the earlier version, this one is a work of fiction. They wanted a statement saying that I as sorry for the crimes that I had committed against North Vietnamese people and that I was grateful for the treatment that I had received from them. This was the paradox — so many guys were so mistreated to get them to say they were grateful. But this is the Communist way. I held out for four days. Finally, I reached the lowest point of my 5 1/2 years in North Vietnam. I was at the point of suicide, because I saw that I as reaching the end of my rope. I said, O.K. I’ll write for them. They took me up into one of the interrogation rooms, and for the next 12 hours we wrote and rewrote. The North Vietnamese interrogator, who was pretty stupid, wrote the final confession, and I signed it. It was in their language, and spoke about black crimes and other generalities. It was unacceptable to them. But I felt just terrible about it. I kept saying to myself “Oh, God, I really didn’t have a choice.” I had learned what we all learned over there.” Every man has his breaking point. I had reached mine. WALLACE: (voice over) People who know McCain well say he can hold a grudge. He also has a legendary temper. But if McCain can be hard on his friends and even harder on his enemies, he can also be very hard on himself. Sen. McCAIN: I m–made serious, serious mistakes and did things wrong when I was in prison, OK?WALLACE: What did you do wrong in prison? Sen. McCAIN: I wrote a confession. I was guilty of war crimes against the Vietnamese people. I intentionally bombed women and children. WALLACE: …and you’d reached the end of the line. Sen. McCAIN: Yes. But I should have gone further. I should have–I–I never believed that I would–that I would break, and I did. After clips of that 1997 exchange emerged, however, McCain released a statement saying that he was referring to the coerced confession when he called himself a war criminal. The idea that McCain confessed to being a war criminal was based on oddly-phrased quotes that were taken out of context. Then, in July 2017, the rumor that John McCain had confessed to being a war criminal took on a new disinformational twist, which was resurrected yet again in March 2019, months after his death from brain cancer the previous August, after U.S. President Donald Trump launched rhetorical attacks at him online and at a rally. 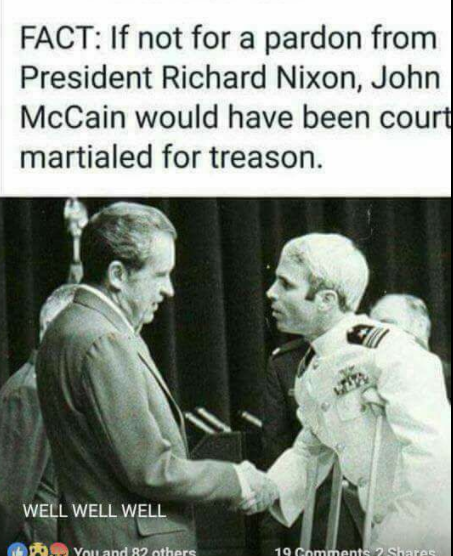 In this version of the now-weaponized rumor, McCain was convicted of treason and sentenced to death by firing squad, but luckily for him he received a pardon from U.S. President Richard Nixon. 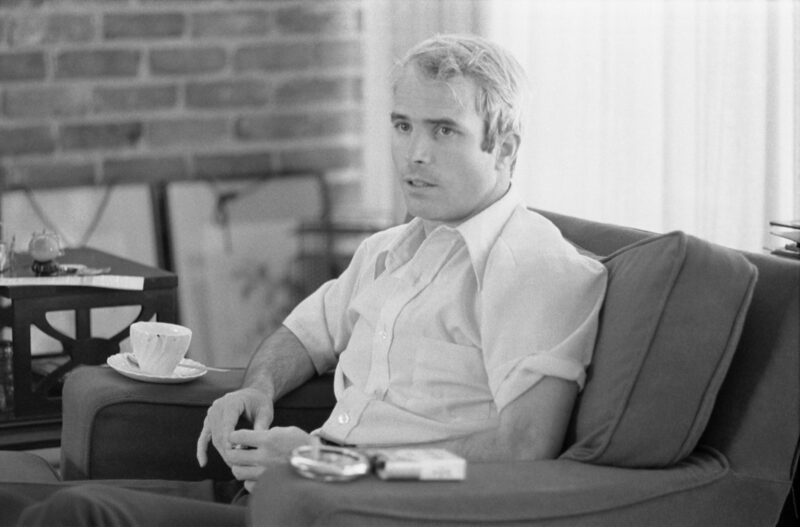 There’s been no indication or proof that that John McCain committed treason and provided information that allowed the North Vietnamese to increase the number of planes they shot down by 64 percent. It’s important to remember that McCain was in captivity for five and a half years, and information about flight patterns likely changed considerably during that time. Also, while the penalty for treason can be death, it’s unlikely that McCain, who was lauded as a war hero upon his return, could have been sentenced to death without widespread public attention. And McCain doesn’t appear on Nixon’s list of notable presidential pardons. Given all that, claims that John McCain was convicted of treason and that U.S. President Richard Nixon pardoned him are demonstrably not true. Phantom "JAJKET" Item Shows Up on Walmart Receipts, Shoppers Charged $10-Investigation Pending! Did Trump Adviser Katrina Pierson Appear to Scold the Late John McCain for His Silence on Dossier? Did John McCain Start the USS Forrestal Fire?